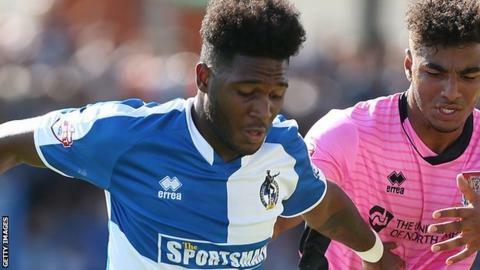 Bristol Rovers came away from high-flying Plymouth Argyle with a point after Ellis Harrison's late penalty. Graham Carey and Hiram Boateng had decent early chances for Argyle while Matty Taylor went close for Rovers. Jake Jervis slotted home Gregg Wylde's cross for an 85th-minute opener. But Harrison was brought down by Luke McCormick for a stoppage time penalty which he converted before the striker had a close-range header well saved by McCormick a few minutes later. Match ends, Plymouth Argyle 1, Bristol Rovers 1. Second Half ends, Plymouth Argyle 1, Bristol Rovers 1. Attempt saved. Graham Carey (Plymouth Argyle) left footed shot from the left side of the box is saved in the centre of the goal. Attempt missed. Chris Lines (Bristol Rovers) right footed shot from the centre of the box misses to the right. Attempt saved. Tom Parkes (Bristol Rovers) header from very close range is saved in the top centre of the goal. Lee Cox (Plymouth Argyle) is shown the yellow card for a bad foul. Attempt missed. Ryan Brunt (Plymouth Argyle) header from the centre of the box misses to the right following a set piece situation. Gregg Wylde (Plymouth Argyle) wins a free kick in the defensive half. Goal! Plymouth Argyle 1, Bristol Rovers 1. Ellis Harrison (Bristol Rovers) converts the penalty with a right footed shot to the high centre of the goal. Luke McCormick (Plymouth Argyle) is shown the yellow card for a bad foul. Penalty conceded by Luke McCormick (Plymouth Argyle) after a foul in the penalty area. Penalty Bristol Rovers. Ellis Harrison draws a foul in the penalty area. Substitution, Bristol Rovers. Jamie Lucas replaces Jermaine Easter. Goal! Plymouth Argyle 1, Bristol Rovers 0. Jake Jervis (Plymouth Argyle) right footed shot from very close range to the bottom right corner. Assisted by Gregg Wylde. Attempt missed. Jake Jervis (Plymouth Argyle) right footed shot from the centre of the box misses to the left. Attempt missed. Ellis Harrison (Bristol Rovers) right footed shot from the right side of the box misses to the left. Attempt blocked. Cristian Montaño (Bristol Rovers) left footed shot from outside the box is blocked. Attempt blocked. Reuben Reid (Plymouth Argyle) right footed shot from the left side of the box is blocked. Attempt missed. Peter Hartley (Plymouth Argyle) left footed shot from more than 35 yards misses to the left. Ellis Harrison (Bristol Rovers) is shown the yellow card for a bad foul. Attempt missed. Graham Carey (Plymouth Argyle) left footed shot from outside the box misses to the left. Attempt blocked. Lee Brown (Bristol Rovers) right footed shot from outside the box is blocked. Hiram Boateng (Plymouth Argyle) wins a free kick in the attacking half. Corner, Bristol Rovers. Conceded by Peter Hartley. Attempt missed. Reuben Reid (Plymouth Argyle) header from very close range is too high following a corner. Corner, Plymouth Argyle. Conceded by Lee Brown.